Recently, I got a case of blueberries from Bountiful Baskets. It had 12 6-oz. containers of blueberries. We, of course, ate some right away, but the rest I wanted to freeze so we could have blueberries for smoothies and other things in the upcoming months when blueberries aren’t available. I had read that it’s best to not wash the berries before freezing. 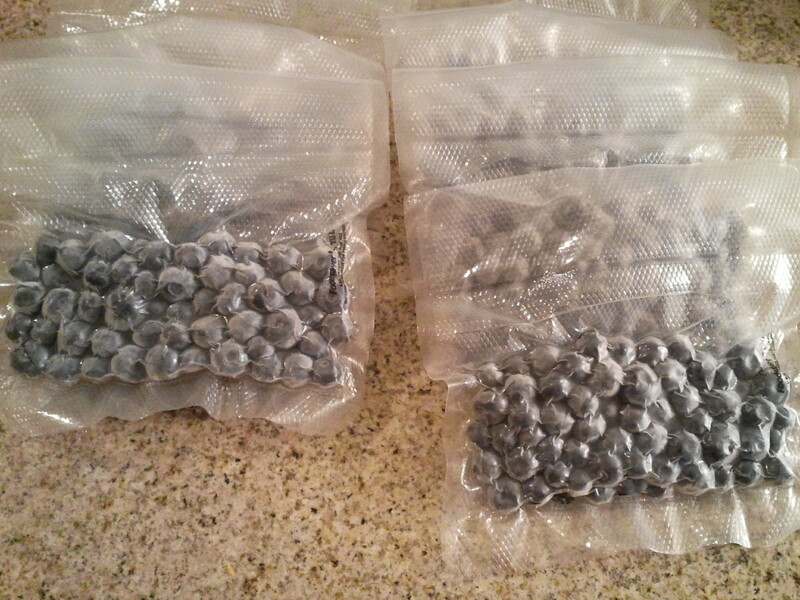 Then, because I wanted to vacuum seal them, I wanted the berries to be frozen first. So, I took a large jelly roll pan and made a single layer of berries in the pan. This was 7 containers worth of berries. I let them sit in the freezer overnight, and actually part of the next day because I forgot about them, and made sure they were all fully frozen. 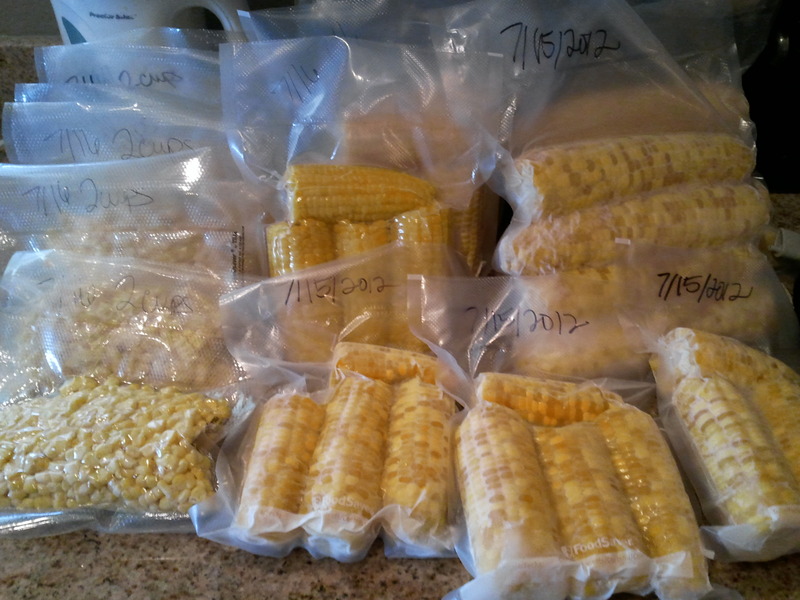 Then, I divided them into FoodSaver bags, one bag had the same as what was in each 6-oz. container, which was about 1 cup of blueberries. I vacuum sealed them and put them in the freezer! When I am ready to use them, I will rinse them first since I didn’t rinse them before freezing. About a month ago, I found myself short on onions. How, I’m not sure, but it happened. That has since changed, as today I looked and I had 6 onions sitting on my counter. So, what to do with them? What I’ve been doing with a lot of other things, freezing them. I really, really don’t have a lot of room left in my freezer, but these bags are small and can go into the nooks and crannies of the deep freeze. To start, I cleaned and peeled the onions, then used my Pampered Chef food chopper to dice them up. I could have used my food processor, but’s a 2 cup size, so not really worth the hassle of using. I want to get a bigger, nicer one some day. Anyway, once it was diced, I put 1 cup portions into FoodSaver bags that I cut to size. The onions were a little juicy, so I first put them in the freezer to freeze, then vacuum sealed them to avoid getting moisture in my FoodSaver unit. 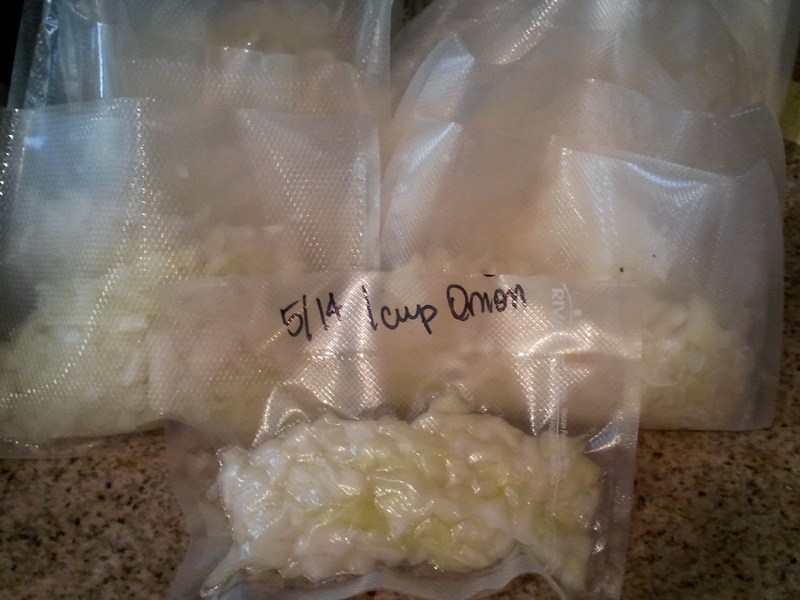 The 6 onions yielded 12 1-cup bags of diced onions. I plan on using these for soups, stews, casseroles, that sort of thing. It will be really nice to have onions pre-cut, got all the tears out of the way today instead of crying more in the future while cutting. We love smoothies in our house, but the cost of berries during the winter months is way too pricey for this tight budget family. So, this time of year when berries are cheap is the perfect time to stock up and freeze them to use later. Last year, I stocked up on both strawberries and blueberries, and they got us through until now, when berries are coming back in season. Strawberries have been pretty cheap, about $1.25 for 1 pound, so I have bought some at the store, and then Bountiful Baskets had an 8 pounds for $11, so I bought those as well. 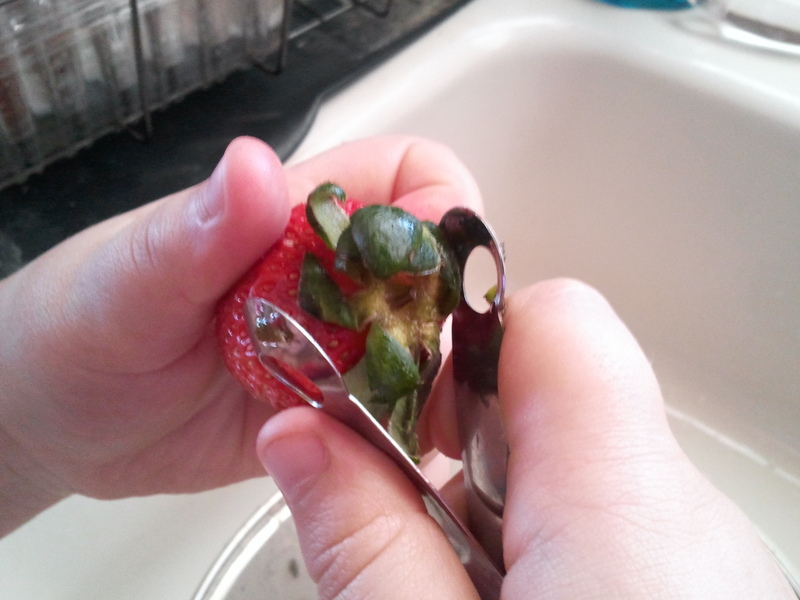 Last year, when I bought the berries, I washed and dried them, then hulled the strawberries. 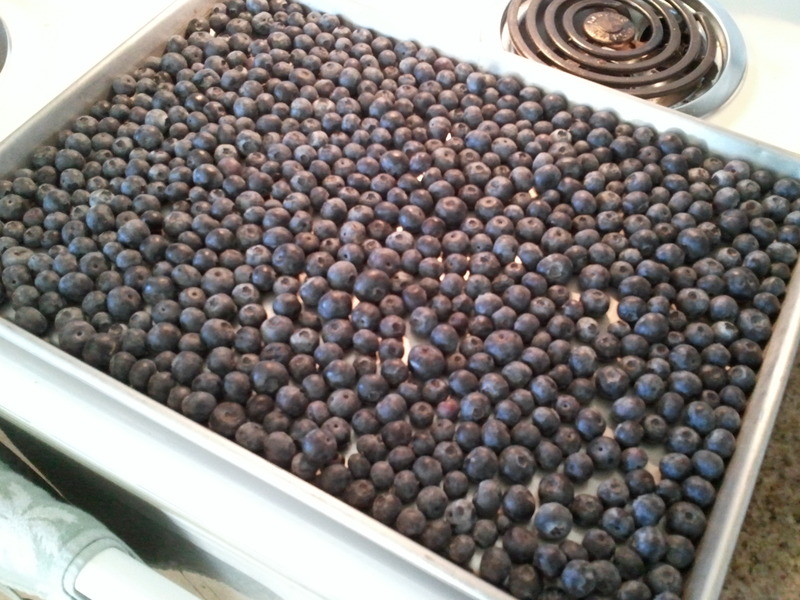 I lined some baking sheets with parchment paper, then spread the berries in a single layer on the baking sheet. I put the baking sheets in the freezer and left them there until they were frozen. I stored them in 1-gallon sized zipper bags. The reason for freezing them in a single layer like that is to prevent them from sticking together while freezing. Since I was putting them in larger sized storage bags and would only use a handful at a time, I wanted to try to prevent the sticking. It worked out well for me. Also, I didn’t have the FoodSaver then, so I removed as much air as I could from the zipper bags by zipping the bag almost all the way, leaving a small opening at the end to put in a drinking straw, then sucking out as much air as I could by mouth. It’s not a perfect method, but will help remove more of the air out of the bag. This year, since I have the FoodSaver and the rolls of bags to create your own size bag, I decided to prepare the strawberries, then put an amount in the bags that would be 1 time use for me. So, to start, I hulled the strawberries using a strawberry hulling tool I bought at the store after last year’s strawberry experience. It’s a simple, little tool. You position it over the leaves and area you want to remove, twist, and pull it out. 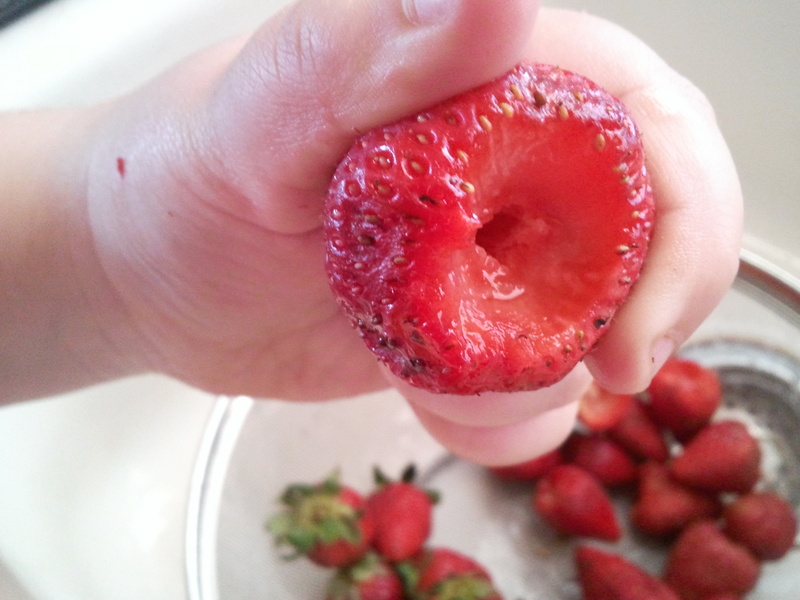 It then leaves a dome-shaped indent at the top of the strawberry. I like this over cutting off the entire top because then I don’t lost as much of the strawberry. I ended up putting about 1/2 pound of strawberries in each bag, then put the open bags in the freezer. 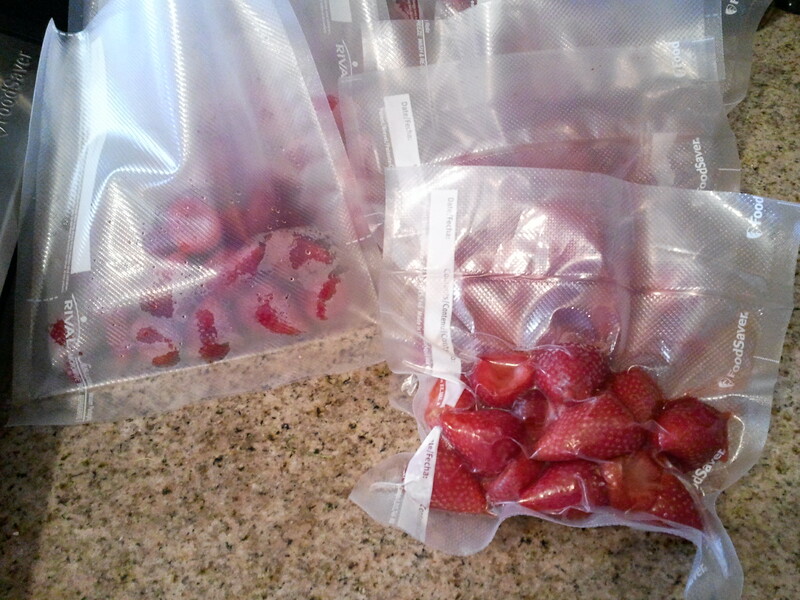 Once the strawberries had frozen, I vacuum sealed the bags. The reason for freezing first is that I was worried about the moisture content of the fresh strawberries. In the vacuum process, I didn’t want liquid to escape the top of the bag, potentially damaging the FoodSaver. So, I now have 12 bags of strawberries in my freezer, and I’m debating on adding more, although my freezer is rather full at this point! I’m a little behind in getting this up. My laptop is out of commission, and I’m having to share time on my desktop with my kids and husband. And, paying bills has been more important than getting a blog post written. Anyway, a few weeks back, I got the 25 pound bag of carrots that was an extra from Bountiful Baskets. Well, I actually got 2 bags, but 1 bag went to my friend’s horses, which they loved for a treat. But, no horses at my house, so I had to figure out what to do with all of mine. First, I filled 2 1-gallon size zipper bags with the whole carrots to go in the fridge. They should last in there for a while. Then, I washed, peeled, and cut 5 carrots into snack sized sticks. After this I had about half the bag left, so I used my mandolin slicer to julienne cut the carrots. I then blanched them (3 minutes in boiling water, drain, 3 minutes in ice water, drain), and measured them in to 2 cup portions. I used a FoodSaver roll to make bags to fit the 2 cups. They were still fairly moist, so I put the open bags in the freezer first, then vacuum sealed the bags after the carrots had mostly frozen. So, now I have 7 2-cup bags of julienne cut carrots to use for soups or stews in my freezer! A while back I posted a tip for freshening up wilted lettuce. 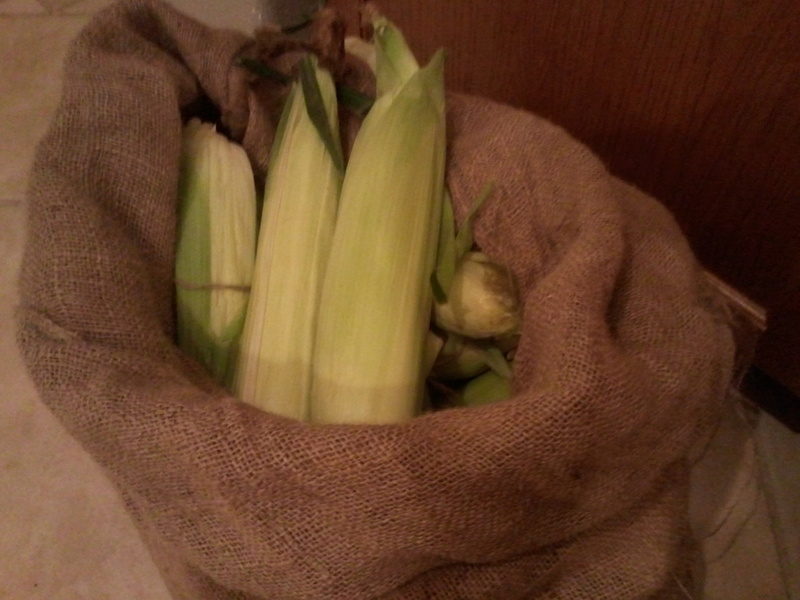 I recently got some celery and wasn’t able to cut and bag it right away, so it got soft and wilted. I remembered reading that you could freshen it up similar to lettuce, so I wanted to see if it would work. But, I tried a different method than I did with the lettuce. To start, you need a tall pitcher or vase. Trim the tops from the celery to fit the size of your pitcher or vase because only the fully submerged parts will crisp up. 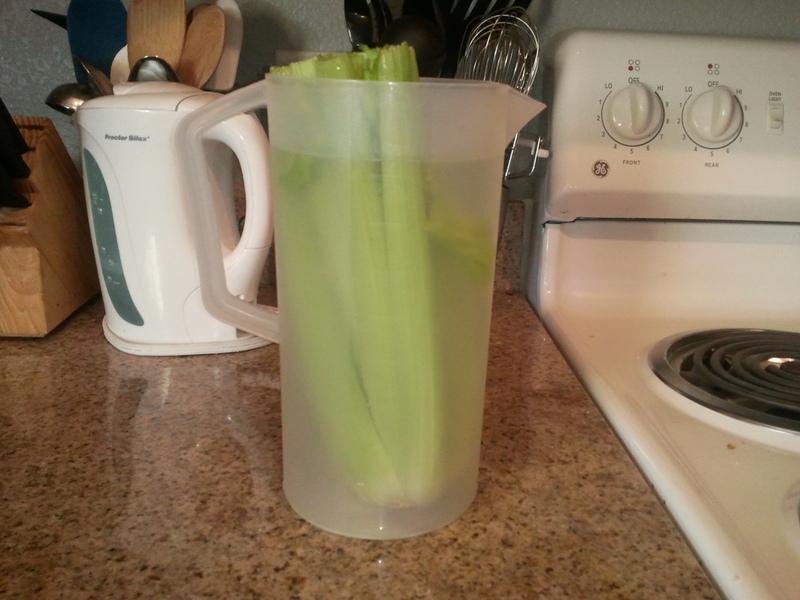 Put the pitcher or vase with the celery in water into the refrigerator for 6-8 hours. I did mine before I went to bed, then checked it in the morning. And, it was crispy again! You will notice that mine is not fully submerged, that was an experiment on my part. The top that was not in water was still soft, but the rest that was in water was crispy. I cut and put in a vacuum sealed zipper bag (I have a FoodSaver FreshSaver to do this, great tool!) to have as snacks for the rest of the week. Ok, maybe a day in my house because my kids and I love celery. So, before you throw out that wilted celery again, give this a try to see if you can get the crispness back! I’m really liking Zaycon Foods so far. You order and pay online, then when you pick it up, you don’t even have to get out of the car, they load it for you. Buying meat this way, then getting produce from Bountiful Baskets, makes it so that I don’t have to be in the grocery store as much. This is nice for a couple of reasons, one is that I don’t have a lot of time for long trips, and another is that I don’t have to make my kids be in the grocery store as long. This was actually one of the largest ones, weighing about 2 pounds. I first cut it down the middle, then trimmed off the extra fat. I also trimmed some of the chicken from the undersides. Those pieces I cut in smaller pieces and collected in a measuring cup to get to 2 cups. The recipes I use that call for diced chicken or pre-cooked chicken typically are for 1 cups of chicken, and this ends up being about 1 pound worth of chicken. 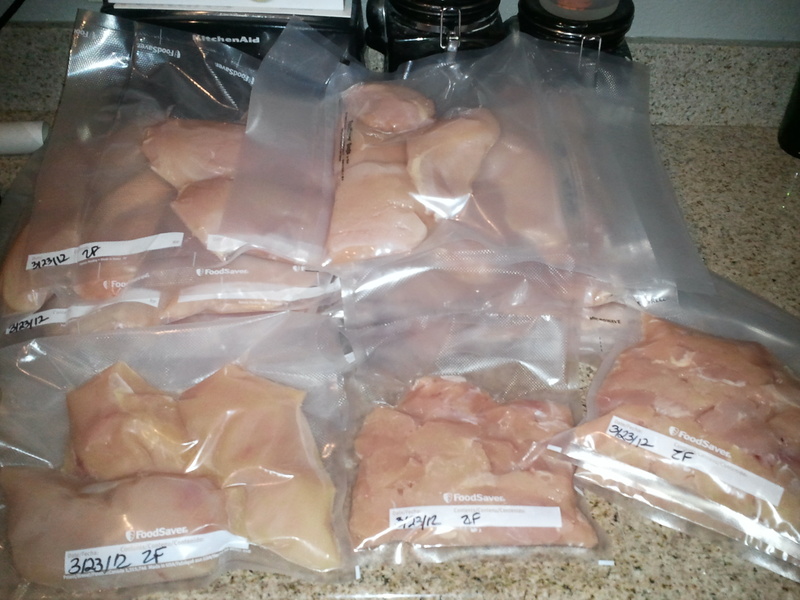 Once that was all done, I decided to put 1.5 to 2 pounds of whole chicken breasts into each bag. I used a roll on my FoodSaver to create my own size bags for this. I cut the larger size chicken breasts in half, so those bags had 4 chicken pieces, then the smaller ones I would put 3 pieces in a bag. It was a lot of work! 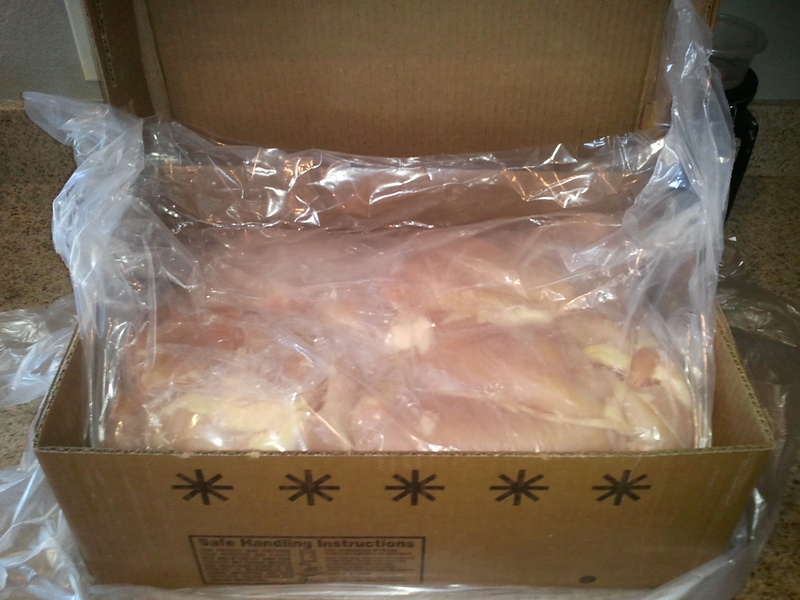 I ended up with 16 bags of whole chicken breasts, weighing between 1.5 – 2 pounds each and 4 bags of diced chicken pieces, that were 2 cups or 1 pound each. My freezer is now just about full! So, I guess my hopes of buying a 1/4 cow are on hold for now. I’m happy to have the chicken and looking forward to getting to try it out! Now that I have a variety of meat in the freezer, when I make my meal plan for the week, I can take out the meat I need for the week and not worry about if I can get the meat on sale at the grocery store. This also means I need to have a good system for labeling and inventory of the freezer, which I will talk about in a later post. Last month, I bought seafood from a Zaycon Foods event, and have been very pleased with the process and quality of the seafood. So, when the opportunity came to get 93/7 ground beef, German sausage, and all beef hot dogs I went for it. In the picture above, the German sausage is top left, all beef hot dogs top right, and the 2 big chubs are the ground beef. 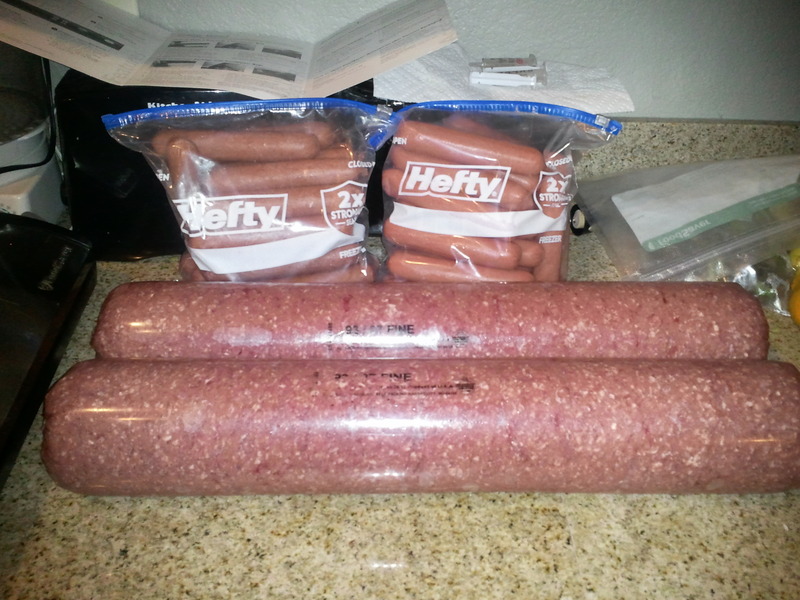 I split the order with a friend of mine, so my share was 20 pounds ground beef, 5 pounds German sausage, and 5 pounds all beef hot dogs. The ground beef ended up being only 38 pounds, and my part was just over 19 pounds, so I will get a credit for the 2 pounds not in the box. The German sausage had 49 pieces, so we split it 24 for me, 25 for her. The hot dog box had 51 pieces, so 26 for me, 25 for her. I recently got a Foodsaver from a friend of mine that she was no longer using (thank you Rebecca! 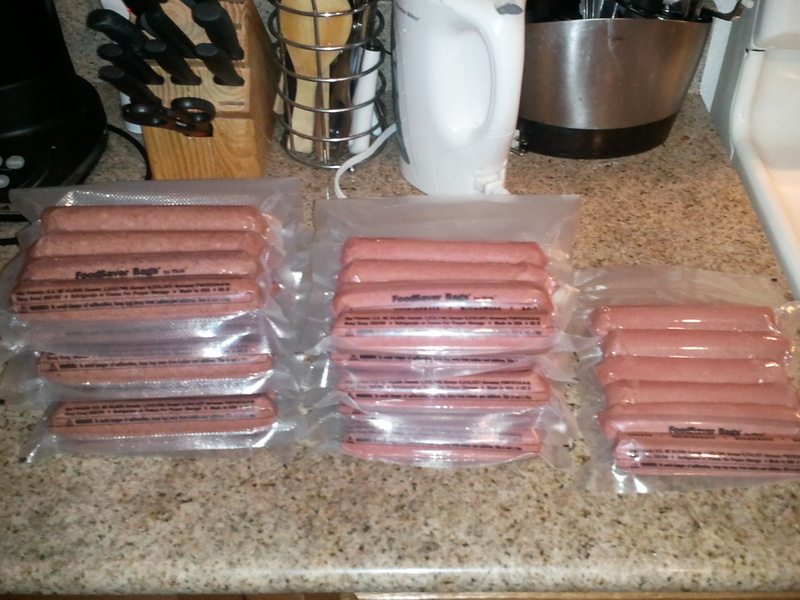 ), so I put it to use for the first time for this meat order to package it all for the freezer. 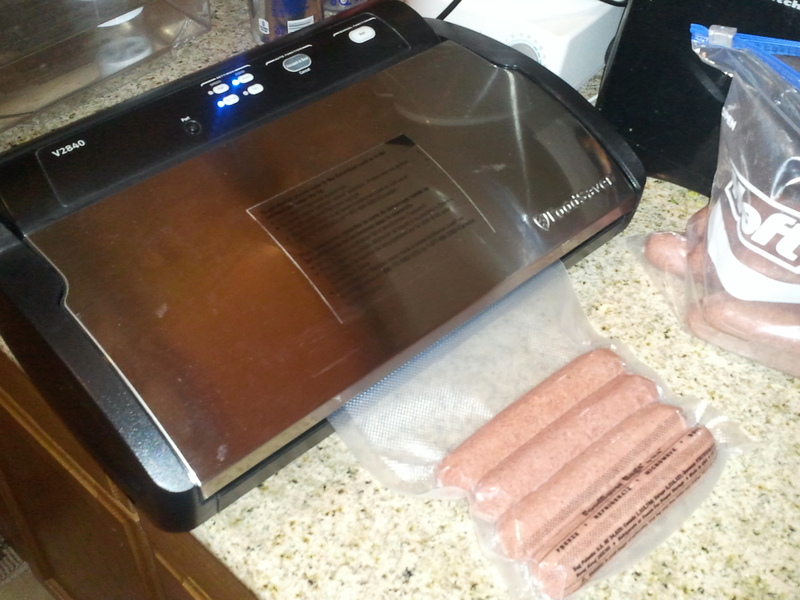 For the German sausage and hot dogs, I put 4 pieces in a quart size bag (1 bag of hot dogs had 6) and vacuum sealed them. Next, I worked on the ground beef. 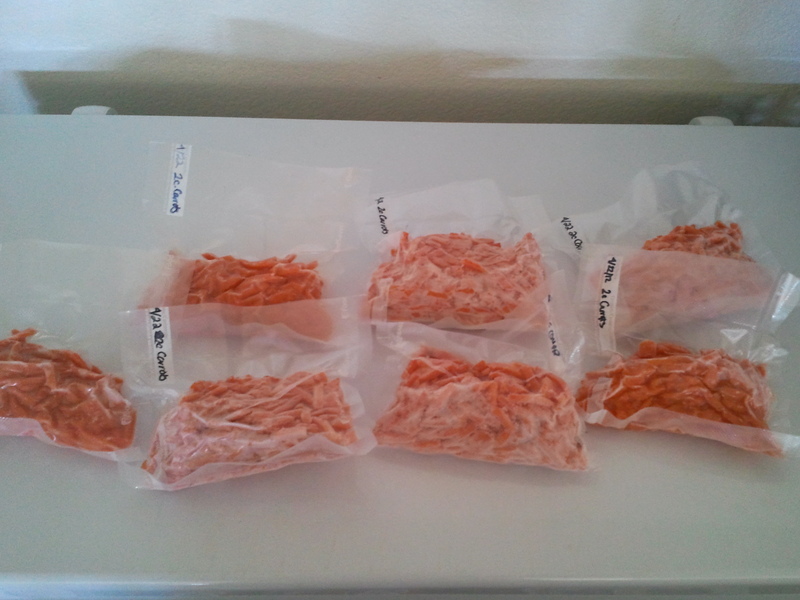 I weighed out 1 pound sections using my food scale, then again used quart sized bags to vacuum seal it. 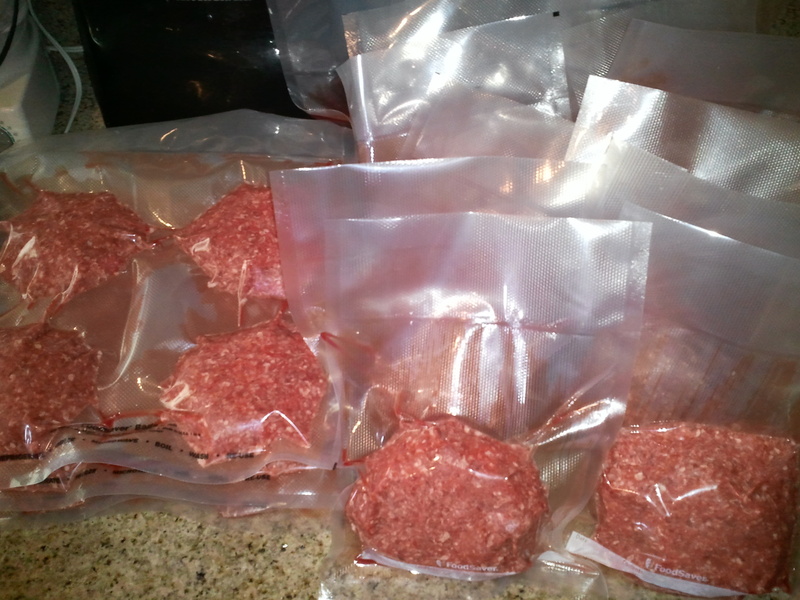 I also used some of the beef to make bags of 4 patties, each 1/3 pound, to quick thaw for burgers. I ended up with 14 one pound packages and 5 packages of four, 1/3 pound patties, about 5.3 pounds total. It was a bit of work, but worth it to have meat ready in the freezer. 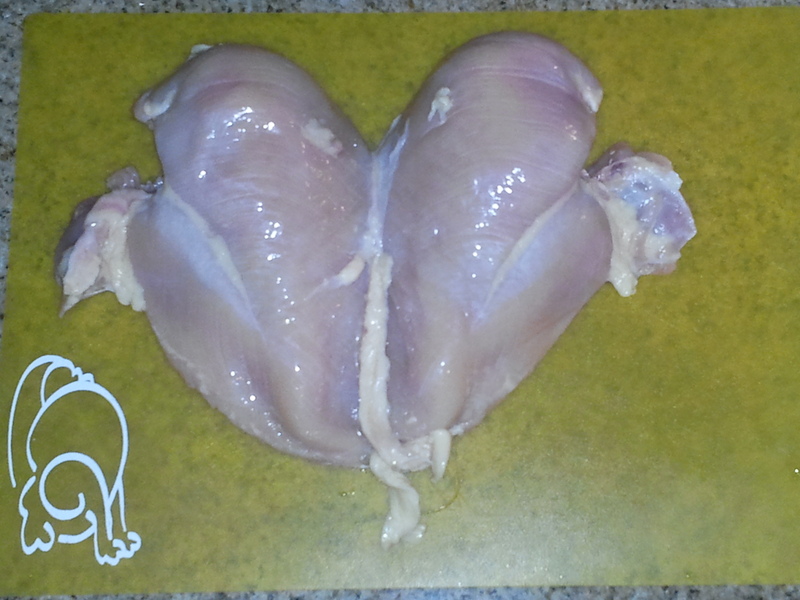 This week, I am picking up chicken from Zaycon Foods, and I am working on how I will prepare all of it for the freezer.